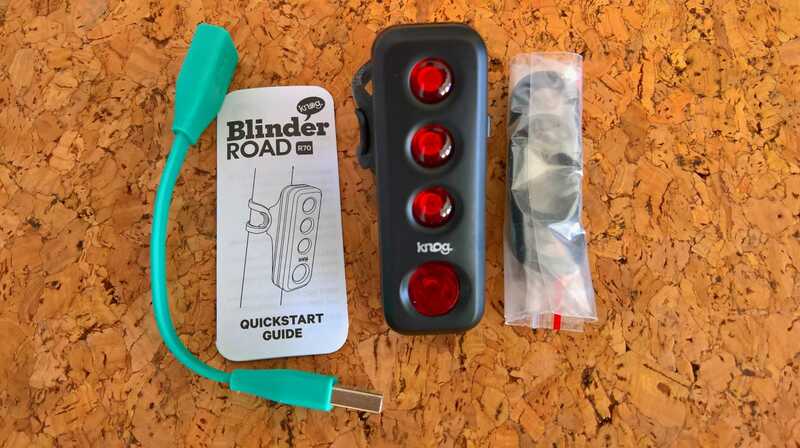 The Knog Blinder Road R70 is perhaps one of the most reliable bike rear lights on the market today that I’ve had the opportunity to use. 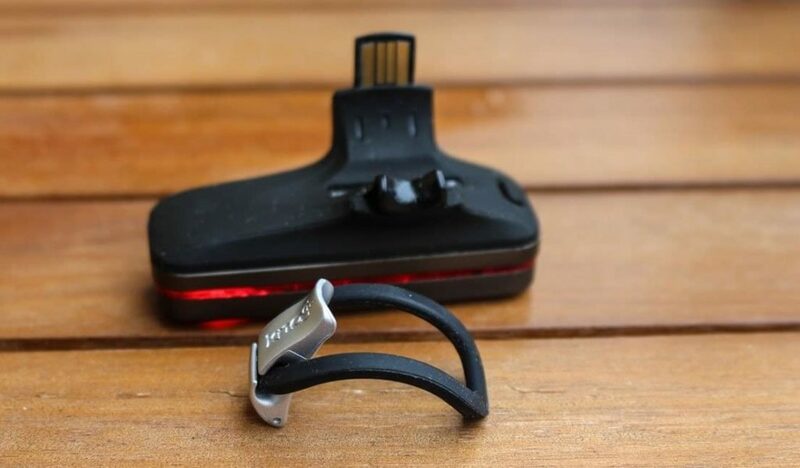 It’s designed by Melbourne based, Knog who is well-known for designing high quality cycling accessories. If you are looking for a rear light with a sleek design that will grab the attention of drivers behind you, look no further than this one. 4 Powerful LEDs with a maximum brightness of 70 lumens that makes you highly visible on all occasions. 100% Waterproof USB-male Plug for charging. There are no rubber seals to cover the charging ports. Compatible with all types of seatposts. You can use it on round (22-32mm) and aero seatposts. Single button operation used toggle between modes and to turn on/off. Sleek design. Not the typical rear light design you'll commonly see. Free replacement straps. You can order them directly from Knog's website. Rubber strap is prone to breaking. This is mostly reported on aero seatposts. At 70 lumens, the Knog Blinder Road R70 holds the credential of delivering an exceptionally bright and visible light. The Collimated optics lens design allows the light to maintain constant brightness for you to be seen by other drivers from a distance. And it comes with 5 different light modes that you can choose from. I find myself using the Eco Flash mode 90% of the time for a simple reason. With this mode, there are 3 flashes on the 3 smaller LEDs followed by a single large flash on the large LED at the bottom. I find this type of flash beam attracts the most attention and it also last the longest. 20 hours! As with most rear lights today, you can operate the Knog Blinder Road R70 with just a single button situated at the back of the unit. Beside the button, you’ll find a battery level indicator light. There are only 2 levels of indication; low battery and fully charged. I find this itself is more than enough for my needs. It also comes with an in-built memory where the light remembers the last light mode you were on. However, this gets cleared off each time you charge it. Knog have done good job by offering you 3 easy-to-attach rubber straps (long and short) that you can use on seatposts of various sizes from 22 to 32mm in diameter. And yes, it’s also compatible with aero seatposts. You can easily swap the rubber straps without much hassle. Having used and stretched the straps many times over my aero seatposts, I find that they’re prone to breaking. The good news is, you can order them for FREE directly from their website. You’re after a bike tail light that does well in all departments; from brightness to battery life, built, mounting and most importantly design. It comes with a price tag that is higher than most of its competitors. So, if you’ve the budget for it and want a rear light that blends in perfectly with your seatpost, then I strongly recommend the Knog Blinder Road R70. The Cateye Rapid X3 is an upgrade to the Knog Blinder Road R70 in terms of brightness. There are 6 light modes available for you to play around. With 100 lumens at its maximum, you can be assured that it’s really really bright. But with only 1 mode at 100 lumens and the remaining 5 ranging between 20 to 50 lumens, this is where the Knog Blinder Road R70 wins over. At 100 lumens, the battery only last an hour, which is a little disappointing really. The light can be mounted on both round and aero seatposts as well as the seat stays. It comes with 2 rubber bands in the box, long and short for this.